New Wave Domesticity: Thailand Adventure: Bangkok! I just returned from my two week stay in Thailand! My head is still spinning a little trying to grasp all the amazing things I've been lucky enough to experience in the past few weeks! The trip taught me a lot of things about myself. Being a solo traveler can be hard, but I also think it opened me up to the experience on a different level. I learned that I'm much stronger than I thought I was and each successful public transit trip or food order felt like a little win. Being alone also helped me to be open to meeting a lot of wonderful and interesting people from all over the world. I connected and learned a lot about more than just Thailand during the trip and I am so grateful for my experiences! There were a lot of highlights and want to document them and share them with you. I feel like I could easily write 20 posts about all the amazing things I experienced, but I will spare you every single detail and instead share just a few post over the next couple weeks in several different posts. The first leg of my trip was in Bangkok. I started my time in Bangkok with an amazing scooter tour (I will share more about that soon!) that helped me get acclimated to the city and get a glimpse of the things I wanted to go back to see more of. It really got me excited and inspired to start my journey. From Bangkok, I took a day trip to visit the Damnoen Saduak floating market. 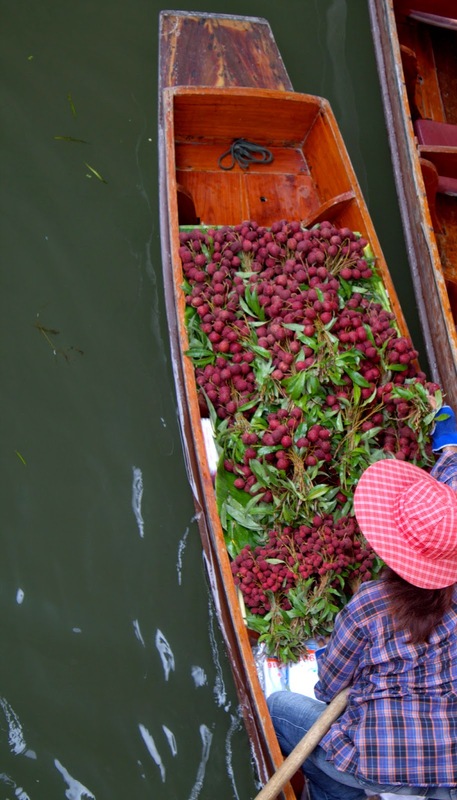 Floating markets are something I've dreamed of since seeing colorful glimpses of them in books as a little girl. 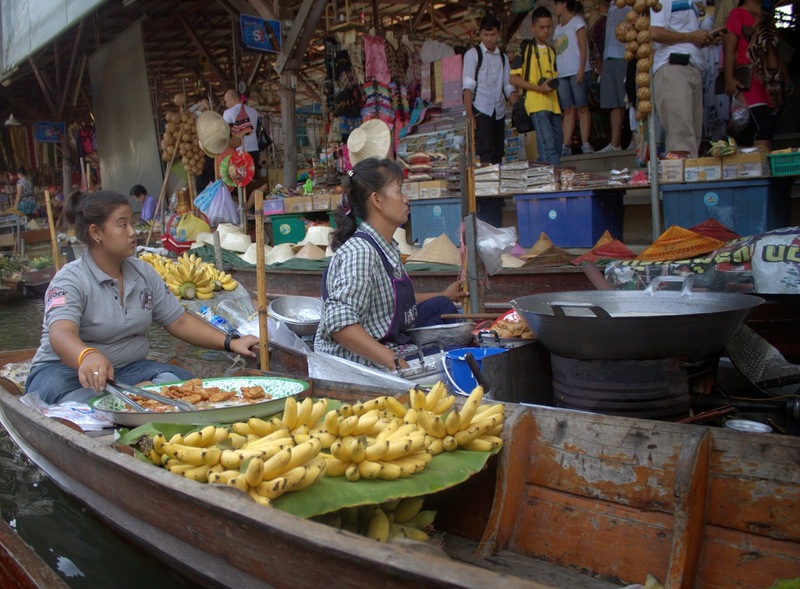 The truth is, the days of true Thai commerce and trade in the waterways of Damnoen Saduak are gone and this market is vastly a tourist destination. The boats are mostly full of the same tourist knick knacks you find all over Thailand and eager shopkeepers trying to pull you and persuade you to spend your tourist dollars instead of what I imagine used to be filled with beautiful produce and handicrafts once upon a time. Even so, it was a really fun visit and I am glad I went. It was a bit of a drive, but once we arrived, we got into boats and floated along the canal inundated with beautiful colors and smells from every direction. I ordered some amazing food from a vendor making impressive traditional food out of her small longboat and it was definitely an experience for me. I spent a day in Bangkok floating up the Chao Phraya River (which is part of the Bangkok public transit system and costs only a few dollars for a day of cruising and getting off at as many stops as you want! Such a great way to see the city!). I visited some of the most unbelievably beautiful and sacred temples I could ever imagine. The Grand Palace is a massive expanse of beautiful building after beautiful building, each more grand than the last. It was like a maze of gold gilded walls with striking gems and bright colored details. The smell of inscense and flowers filled the air as people came and gave prayer to the gorgeous altars. Just around the corner from the Grand Palace is Wat Pho. While Wat Pho is not quite as large and grand as the palace, it had it's own captivating charm. Wat Pho is most famous for being the home of the largest reclining Buddah in the world - it was an imense and beautiful sight to see and it made me feel quite small as I stood at the foot of the this massive beautiful gold, shiny monument. Wat Pho is also famous for being the home of the first school of traditional Thai Massage. If you have never had a Thai massage, it's really unlike any massage you've had in the past - a combination of yoga stretches, pressure points, and rhythmic pressure. A massage was the perfect break from the heat of the day. Also around the corner, I took a short walk through the Amulet Market to admire some beautiful precious amulets, charms, and talisman that pay homage and bring fortune. I was a little overwhelmed by the shopping experience in Bangkok because the options seemed so expansive and endless. I'm not a big mall shopper, but I do love a flea market and Bangkok is home to one of the world's largest - Chatuchak Weekend Market. It is 35+ acres of 15,000 stalls selling everything from pottery to clothing to squirrels. It's really an overload of the senses. More than really the act of buying things, I just enjoyed the experience of getting lost in the stalls, eating bites of all the amazing food vendors, and taking it all in. So much delicious food. Overall, Bangkok was an incredible experience. The city was full of life and it sometimes felt endless. After Bangkok, I headed north to Chaing Mai. Stay tuned for lots more!